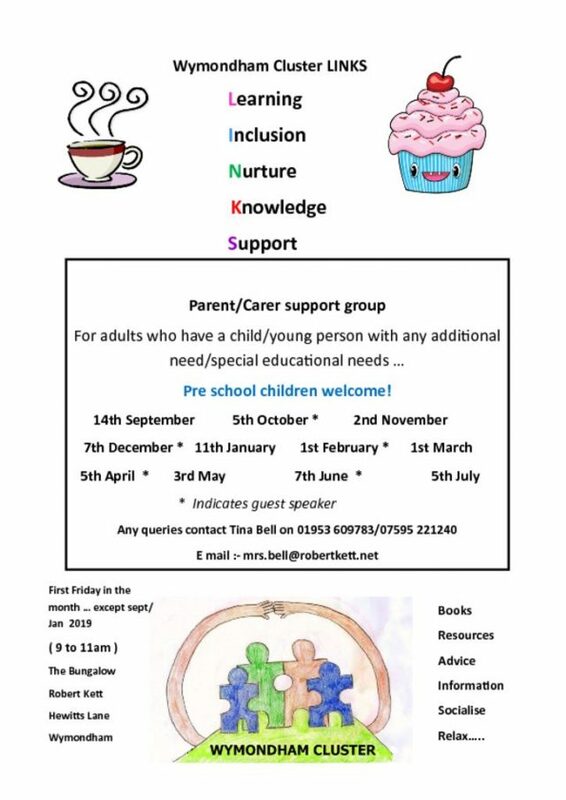 Cluster SENDCo’s, PSA, and SEND facilitator hold a termly parent forum event at a local school, its an informal opportunity for parents to meet, share information and learn about any SEND developments. Events are publicised through flyers and the school letter. The agenda is developed in consultation with parents. For further information please speak to the school SENDCo, PSA or SEND facilitator. This report is published in September and reviewed in July of each academic year, it is also regularly updated by the school Inclusion Manager. 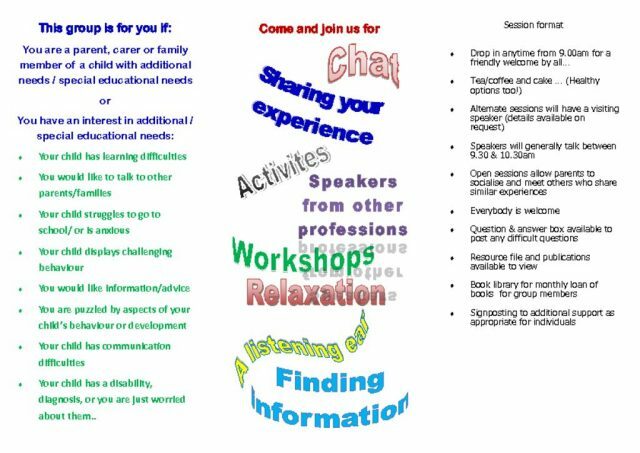 If you have specific questions about the Norfolk Local Offer please visit www.norfolk.gov.uk/Childrens_services/Special_educational_needs_and_disabilities/. Alternatively if you think your child may have SEN then in the first instance then please speak to their Class Teacher or contact the Inclusion Manager. As part of the Inclusion Managers monitoring programme they regularly seek and invite feedback from parents, carers, pupils and other stakeholders. At Ashleigh Primary School and Nursery we believe in participation for all. We want all adults and children to participate in learning and we celebrate all members of our community. We want to create an inclusive culture in our school and we strive to be responsive to the diversity of children’s backgrounds, interests, experience, knowledge and skills. We value high quality teaching for all learners and actively monitor teaching and learning in the school. For more information on our approach please see our Learning Policy Sept 2018. Our school improvement plan is about developing learning for all and is used to plan continued professional development (CPD) opportunities for all staff. Our latest plan can be found here. We aim to create a learning opportunity which is flexible enough to meet the needs of all members of our school community. We monitor progress of all learners, and staff continually assess pupils to ensure that learning is taking place. Our whole school system for monitoring progress includes regular pupil progress meetings with staff. For pupils who are looked after, adopted and also have special educational needs the school works closely with the Virtual School, carers and outside agencies to ensure bespoke provision. The Designated Teacher for Looked After Children ensures ongoing rigorous assessment and monitoring. If a learner is identified as having SEN, we will provide provision that is ‘additional to or different from’ the normal differentiated curriculum, intended to overcome the barrier/s to their learning. At Ashleigh Primary School and Nursery we are committed to ensuring that all learners have access to learning opportunities, and for those who are at risk of not learning, we will intervene. This does not mean that all vulnerable learners have SEN. Only those with a learning difficulty that requires special educational provision will be identified as having SEN. Barriers to learning-core offer. Our SEN profile for 2018-19 shows that we have 11% of children (excluding Nursery), identified as having SEN, and 0.4% have an Education Health and Care Plan or Statement of Educational Need. Class Teachers, support staff, parents/carers and the learner themselves may be aware of a difficulty with learning. At Ashleigh Primary School and Nursery we ensure that assessment of educational needs directly involves the learner, their parents/carer and of course their teacher. The SENDCo will also support with the identification of barriers to learning. We have a range of assessment tools available, and our updated tool kit for 2018-19, which we share with our cluster of schools. For some learners we may want to seek advice from specialist teams. In our school and cluster we have access to various specialist services. We have access to services universally provided by Norfolk County Council, which are described on the Local Offer website available here. Schools within the cluster also work with community and specialist speech and language therapists. Ashleigh Primary School and Nursery employs 27 FTE Learning Support Assistants who deliver the interventions in the provision map as coordinated by the Head Teacher and Inclusion Manager. Every Teacher is required to adapt the curriculum to ensure access to learning for all children in their class. The Teacher Standards 2012 detail the expectations on all teachers, and we at Ashleigh Primary School and Nursery are proud of our Teachers and their development. The Teacher standards are available here. Each learner identified as having SEN, is entitled to support that is ‘additional to or different from’ a normal differentiated curriculum. The type of support is dependent on the individual learning needs, and is intended to enable access to learning and overcome the barrier to learning identified. This support is described on a provision map, which although does not detail the individual learner names, describes the interventions and actions that we undertake at Ashleigh Primary School and Nursery to support learners with SEN across the year groups. We modify the provision map regularly, and it changes every year, to reflect the changing needs of our learners. The school provision map for 2018-2019 is available here. Please also see practical support strategies to overcome barriers to learning. In consultation with the individual child and parents, teachers will complete an ‘All About Me’ document to ensure that children are fully involved in their own learning. We work closely with other schools and professionals to ensure that we identify and work with high quality intervention programmes. At Ashleigh Infant and Nursery School we share the provision map with our colleagues in the Wymondham Cluster so we can learn from each other, share best practice and demonstrate what we offer for learners with SEN. We are also able to promote consistent practice across all the schools in our cluster ensuring equality of opportunity. Our best endeavours are undertaken to ensure that pupils with SEND are able to fully engage in all school run activities. Ashleigh Primary School and Nursery receives funding directly to the school from the Local Authority to support the needs of learners with SEN.
All schools in the Wymondham cluster have signed a governance agreement which helps us work together. The Cluster policy for SEN is available here. Monitoring progress is an integral part of teaching and leadership within Ashleigh School and Nursery. Parents/carers, pupils and staff are involved in reviewing the impact of interventions for learners with SEN. We follow the ‘assess, plan, do, review’ model and ensure that parents/carers and children are involved. Before any additional provision is selected to help a child, the Inclusion Manager, Teacher, parent/carer and learner agree what they expect to be different following this intervention. A baseline will also be recorded, which can be used to compare the impact of the provision. Children, parents/carers and their teaching and support staff will be directly involved in reviewing progress. This review can be built in to the intervention itself, or it can be a formal meeting held at least once a term, where we all discuss progress and next steps. If a learner has an Education Health and Care Plan (EHCP), the same termly review conversations take place, as well as an annual formal review of the EHCP. The Inclusion Manager collates the impact data of interventions, to ensure that we are only using interventions that work, we largely use research based interventions to ensure the quality of our provision. Intervention data is shared with the Wymondham cluster so all SENDCos in our cluster are able to select high quality provision. Progress data of all learners is collated by the whole school and monitored by Teachers, Senior Leaders and Governors. Moderating both internally and externally ensures that our judgments stand up to scrutiny. Our school and cluster data is also monitored by the Local Authority and Ofsted. All learners should have the same opportunity to access extra-curricular activities. At Ashleigh Primary School and Nursery in 2018-19 we offer a range of additional clubs and activities, for further information please contact the school office. Ashleigh Primary School also offers ‘Ashleigh Tree House’, a breakfast and after school club available from 3+ years. For further information wither visit our website or click here. All staff at Ashleigh School and Nursery observe the requirements as set out in the Equality Act 2010. This legislation places specific duties on schools, settings and providers including the duty not to discriminate, harass or victimise a child or adult linked to a protected characteristic defined in the Equality Act and to make ‘reasonable adjustments’. Transition is a part of life for all learners. This can be transition into Nursery, a new class in school, having a new teacher, or moving on to another school, training provider or moving in to employment. Ashleigh Primary School and Nursery is committed to working in partnership with children, families and other providers to ensure positive transitions occur. Planning for transition is a part of our provision for all learners with SEN. Moving classes will be discussed with you and your child in the summer term. Transition to secondary schools will be discussed in the summer term of their Year 5, to ensure time for planning and preparation. Bullying is anti-social behaviour and can affect anyone; At Ashleigh it is unacceptable and will not be tolerated. The anti-bullying policy can be accessed on the website. Ashleigh Primary School and Nursery is our community school. We can shape and develop provision for all of our learners ensuring achievement for all. This SEN report declares our annual offer to learners with SEN, but to be effective it needs the views of all parents/carers, learners, governors and staff. So please engage with our annual process to ‘assess plan, do and review’ provision for SEN. Complaints from parents of children with SEN should be directed to the School Inclusion Manager (SENDCo), in the first instance. 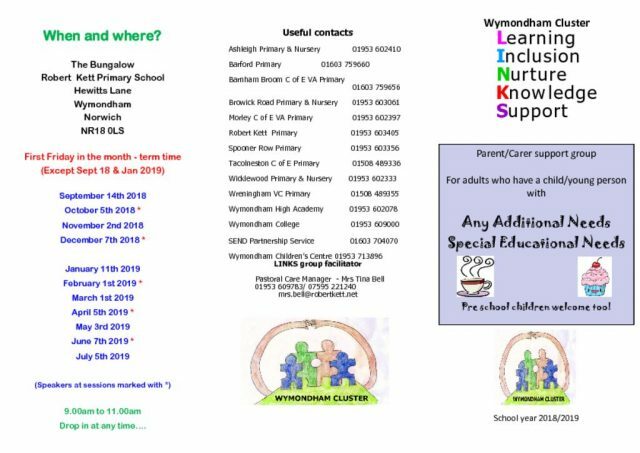 Ashleigh Primary School and Nursery as part of the Wymondham cluster group of schools, work alongside the Pastoral Care Manager facilitating a parent support group Learning, Inclusive Nurture, Knowledge and Support (LINKS). The group meets regularly to share ideas, experiences and information. This SEN report is reviewed annually at the end of the summer term by the Inclusion Manager (SENDCo and SEND Governor).